> Green walls – are structures that contain soil or another growing medium across their surface or volume, and are thus normally filled or interpenetrated by the root systems of the plants that grow on or in them. > Green facades – are essentially vertical trellises or framework structures that support the branch systems of plants – ones planted in the ground or containers at the framework’s base, or in floating containers attached at regular intervals to the facade frame. Given these differences in basic design – and in addition to climate, location, and usage considerations – green walls and green facades naturally lend themselves to different types of plants and uses. In general, green walls will do better with plants that have shallow root structures and relatively compact overall shapes – such as mosses, ferns, and herbaceous plants, but potentially including vines – since there is typically limited room for both root and plant growth in green walls. By contrast, green facades favor hearty vines, bushes, and other branching and woody plants, including espaliered trees, that can grow robustly and at some distance from their soil source – and steadily spread to fill the facade framework. As you can see, when attentively designed, green walls and green facades offer many important aesthetic, ecological, and financial benefits. And as mentioned before, their ability to reduce building costs – via reduced needs for ornamentation and lowered energy use over time – can lead to positive economic returns and fully offset the initial costs of living wall construction. Still, despite these common aspects of all living walls, there are significant practical differences between green walls and green facades, making each more suitable for different settings and applications. I’ll cover these differences in the next two sections. As outlined in my definitions, green walls are designed structures that contain soil or another plant medium as in integral part of the wall structure. In addition to soil, plant media can include natural textiles, such as felt or coir fiber, and even plastic sheets and other materials in the case of fully hydroponic systems. The type of plant medium used will of course naturally impact green wall design requirements and constraints, including the amount of weight the wall must carry. The diagram above (click to enlarge) summarizes the typical designs of green walls. As you can see, the modular approach holds containers or a matrix of soil, usually via a modular panel structure. This type of green wall is thus comparatively heavy, but is also often more resistant to variations in temperature, ranging weather conditions, and water and nutrient supply interruption. 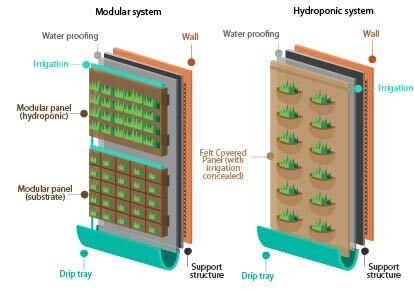 By contrast, and as its name implies, the hydroponic approach to green walls uses no soil, instead employing either a non-soil medium in its place or no medium at all, making the wall much lighter. When no plant medium is used, this is normally accomplished by sandwiching plant roots in plastic or otherwise immersing them in a water-nutrient mix. In all green wall systems, however, nearly continuous plant watering and feeding is normally needed, and is typically provided via closed-loop irrigation systems that circulate water and essential plant nutrients. In general, and despite their added design and resource demands, when highly orchestrated living walls or controlled plant patterns are desired, green walls are the superior choice. Unlike green walls, green facades are framework structures that exist more independently of, or are not as integrated with, the soil or medium in which their plants grow. Instead, green facades are primarily designed to support, and encourage the growth and spreading, of their companion plants. 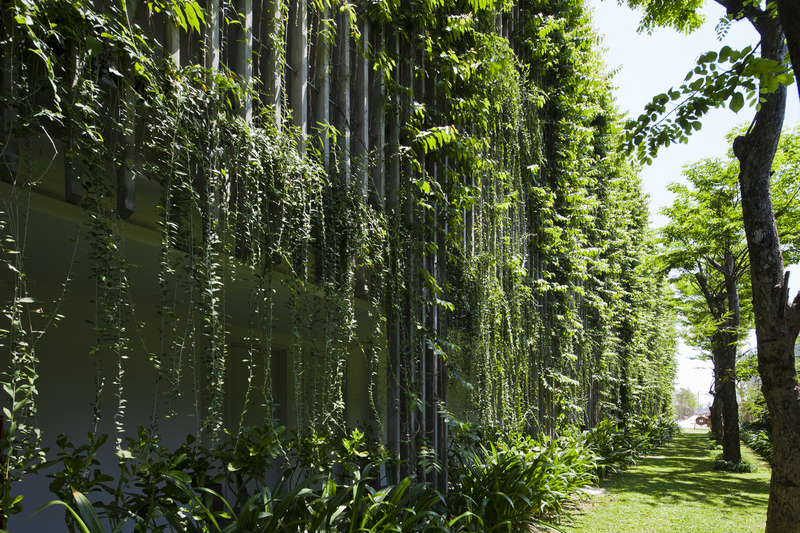 With green facades, plants grow on, rather than in, the wall structure. As mentioned before, green facades use soil (or potentially hydroponic pools) in the ground or containers beneath the facade framework, or in containers placed at set intervals along the facade frame. When plants are grown directly in the ground, or in ground-resting containers, load bearing requirements are often considerably reduced compared with modular green walls. The diagram above (click to enlarge) summarizes three typical designs of green facades. The first simply involves self-clinging plants that grow from the ground and fix themselves to an existing wall. The second design adds an enabling frame attached to a supporting wall at the top and bottom, and perhaps intermediate points, of the frame structure, which holds and supports the branches of ground-rooted plants. The third design further adds periodic containers or planters – for example at each floor in a multi-story building – allowing for green facades of much greater heights than with systems exclusively using ground-rooted plants. You will notice that the second green facade design uses a two-dimensional grid system to support plants, but three-dimensional or space-frame grids can be used as well. In all cases, facade grids can be made of welded or woven metal, metal tension cables, and also using wood and other materials for the frame structure. The grid design itself can be rectilinear, diagonal, and many other shapes – based on both practical and aesthetic considerations. And although plants can be affixed directly or closely to supporting walls, green facade frameworks are often attached to bearing walls in ways that leave some distance between the facade and its supporting wall – for air circulation, plant health, and system durability – as shown in the second and third designs. For these reasons, unless you seek highly composed or controlled plant patterns in a living wall, or require rapid plant in-filling, green facades are normally a superior choice. Have A Wall? Go Green! I hope this overview of living wall systems has been informative to you, and that it will inspire you to build a living wall near you. Green walls and green facades offer many important benefits, in addition to simply being beautiful, uplifting, and renaturalizing. If you would like to learn more about living walls, we recommend Wikipedia Green Wall, Gergely Vizi’s thoughtful video on Living Walls, and GreenScreen’s in-depth overview of green facades (pdf) as good next steps. As we discussed, living walls often can be built at a low cost – and even with the potential for positive financial returns – making them both economically and aesthetically attractive. Given this, I expect green walls and green facades to grow and grow, in popularity and organically, in the years ahead. Let me know what you think in the comments section below. This entry was posted on February 1, 2016, 11:21 am and is filed under Buildings, Communities, Designs, Ideas, Technology. You can follow any responses to this entry through RSS 2.0. You can leave a response, or trackback from your own site.